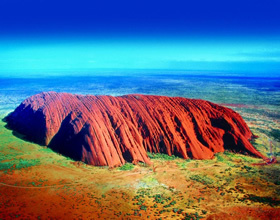 Considering the wonder that is Ayers Rock, the region has gone to great lengths to offer world-class accommodation for international and local visitors. For families and luxury travellers alike, there is abundant 5 star Ayers Rock accommodation, self-catered cabins and desert resorts on offer. Enjoy terraced apartments set into a rich native parkland while featuring fully equipped kitchens, self-serviced amenities and large communal areas. Groups travelling with up to 6 people will love this option as they make themselves at home in the comfortable and secluded lodgings. Visitors seeking mid level accommodation will enjoy the stylish and considered local resort hotel set amongst the areas best restaurants and bars. Designed around a magnificent swimming pool, each room offers private poolside access while deluxe options offer stunning views of Uluru. Families visiting the red centre will be pleased to know that the region also offers a family oriented hotel devoted to delivering true blue outback pioneering hospitality. While the kids will love the hotel swimming pool, parents will enjoy ensuite rooms with air conditioning, TV, radio, a self-service kitchenette and private dining area. Take advantage of the hotel restaurant and bar, the onsite barbeque and glorious outback surrounds. This lodge also offers a complimentary airport shuttle making transport a cinch. Travellers seeking luxury Uluru accommodation will be impressed with Ayers Rocks premier resort hotel. Spacious rooms with private balconies boast views of pristine native bushlands and the glistening resort pool. Enjoy generous ensuite bathrooms with a bath and shower before sitting back to watch in-house movies and cable channels after a long day in the desert. Have a hit on the resort tennis court or down on the putting green before diving into the large lagoon swimming pool, a welcome reprieve from the outback heat.